Three years came and went. And the truth is I was busy, lovesick, on the road, and didn’t notice this year. April 12, that was the 3 year mark. I don’t even know what country I was in. I know that I’m currently in Portugal, and that I’m hopping over to Croatia for five days after this and then on to Italy & France to teach two more workshops before finally, finally running home. Home to breakfasts and weekdays and the gym and yoga and morning coffee and and and home to normal. 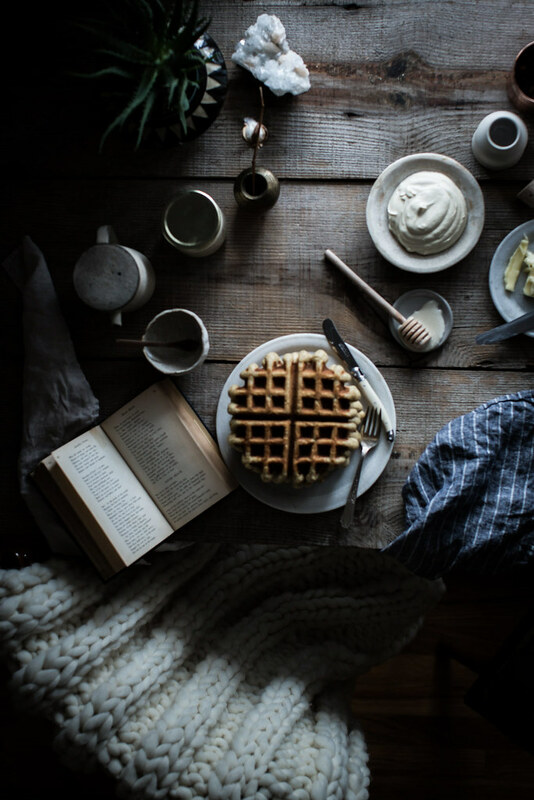 Home to the romance of the ordinary & weekend waffles. This project, this blog, abides as a constant, but my life continues to surprise me in its unfolding. 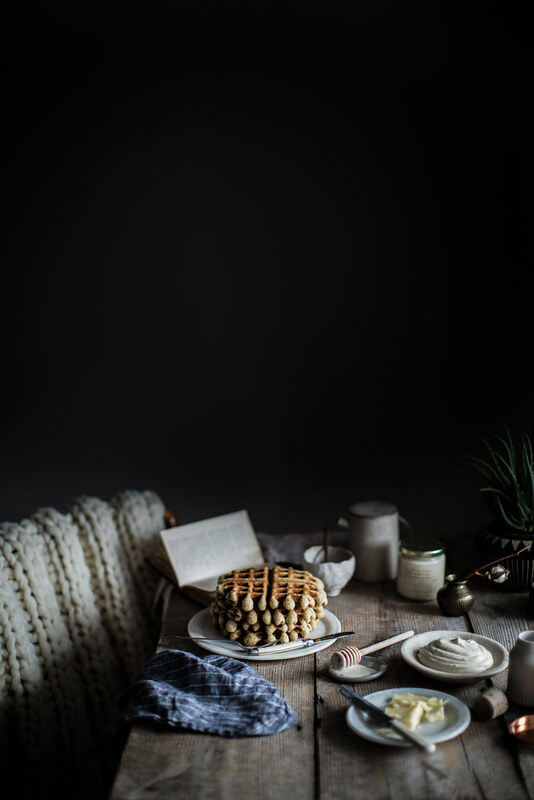 And Earl Grey waffles, a personal favorite comfort food infused with a personal favorite comfort tea, seemed as good a recipe as any to both celebrate 3 years of this space and my current love affair with home, with home defined as being where the heart is. In my life, I’ve taken everything as it comes, when it comes, never pretending at forevers. Okay, sometimes pretending at them but always aware of the precarious nature of pretending. I expected the landscape of my life to forever morph, seashore in the tide, time doing the eroding it’s so adept at, taking and leaving bits and pieces of my world and self as it saw fit. And so it has. Until now. Something curious happened. That lovesick bit I mentioned above. Time, finally, didn’t only take. It brought things back to me, little artifacts & pieces of myself so long lost I wondered if they’d ever existed at all or if I’d just imagined them. I found them again one afternoon in early February, and that unexpected event necessitated many things including briefly but very thoroughly losing my mind, much weeping, and then most finally changing my entire life and being happier than I’ve ever been in some odd 32 years. I’ve weighed the idea of writing about those changes here. There are myriad good reasons not to. But I’ve reached the conclusion that this space is my home, and my experiences are all I know. In short, I don’t think I’ll ever be able to write again if I don’t write about what’s happening now. The short version is simply this: I, most unexpectedly and three weeks before leaving the country for 3 months (impeccable timing), fell in love with a man that is a perfectly impossible ball of contradictions, and I didn’t know what home, love, or forever was until I met him. When I did finally see him—I mean really see him—I knew I’d missed him my entire life. I knew. I knew in a fundamental way I’ve never experienced in my life. People say these things for a reason. What they don’t tell you is that “just knowing” sometimes takes the form of going crazy trying to talk yourself out of it for a couple of weeks. I’d recently started to average about 6 months a year on the road. Terminal after terminal, endless glass walls and escalators—my blood ran electric in even the most mundane of travel scenarios. I have an apothecary routine that can be executed in an airport bathroom in five minutes that simulates all but the psychological effects of a hot shower & a good night’s sleep. I have life on the road down to a science, but oftentimes I don’t know what time or day it is at all. Sometimes I even forget what season or hemisphere I’m in, and I never know how to greet people. Is it one kiss or two? Can I hug? Shake hands? Bow? I like bowing. Nomad. It’s was my thing. Was being the operative word. Though I’m currently still on it, the road leaves me cold. The thrill is gone. Everything I see seems utterly useless without being able to share it. I never thought about that boring old adage “home is where the heart is” until my heart was somewhere else. Now it makes too much awful sense. No wonder I felt so at home on the road; I carried my heart with me wherever I went. Now it’s firmly situated elsewhere, and no matter how rich & alive the countries I wander to are, I’m not whole. I’ve always prided myself on being present, now I flicker in and out like a ghost. My life previously was known. It was comfortable and easy. Familiar. Safe. I found myself more and more married to my work & travel. It had become my child, my life. There was a vein of discontent running through it all, to be sure, but I accepted it. We have to grow up, after all. These are the things we tell ourselves. I wrote impossible worlds at night to keep my blood warm enough. I ran through my life in a manic, workaholic frenzy. It seemed alright. Productive. Responsible. Busy, busy, busy. I wasn’t looking to change anything. Then, this past February, I walked into a coffee shop back home in Chattanooga dressed, in my usual fashion, like a Jedi or Japanese grandmother depending on who you ask. I chatted with the owner (a preternaturally friendly guy…) and, the picture of grace, managed to hit myself in the face with a shopping bag whilst doing so due to my habit of wild gesticulation. We’d talked a few times before. As I recall, I was always saying very attractive things like “I just bought fancy sweatpants!” or “Talking to people makes me sweat profusely.” Oblivious, in a word. And not looking. That’s when these things tend to happen, it would seem. We became friends, and I fell in love with that preternaturally friendly man. Instantly. I was toast. And I knew it. So much so that I, in my infinite wisdom, immediately called a therapist, cried a lot, and sent my closest friends spaghetti emojis to illustrate the state of my brain. I’d work out to prime, vintage Katy Perry tracks until I almost fainted in attempts to forget about him. It seemed impossible. And dangerous. Until about three weeks later when I decided, a week before leaving the country for three months (that awesome timing again), that the only impossible, dangerous thing was to not give us a chance. When I say forever now, there is no disillusioned girl in the back of my mind saying “you can’t really know that”. As it turns out, you can really know that. From a cellular level to a spiritual level, I know. It’s a love I feel made for, designed for. A perfect fit. In all my life, I’ve never felt this way. I’m shocked this is even a way people can feel. I didn’t even know this was a thing. So settled. So done. So homesick. Now I just want to go home to Tennessee and make waffles while he makes the coffee. He happens to be very good at that. 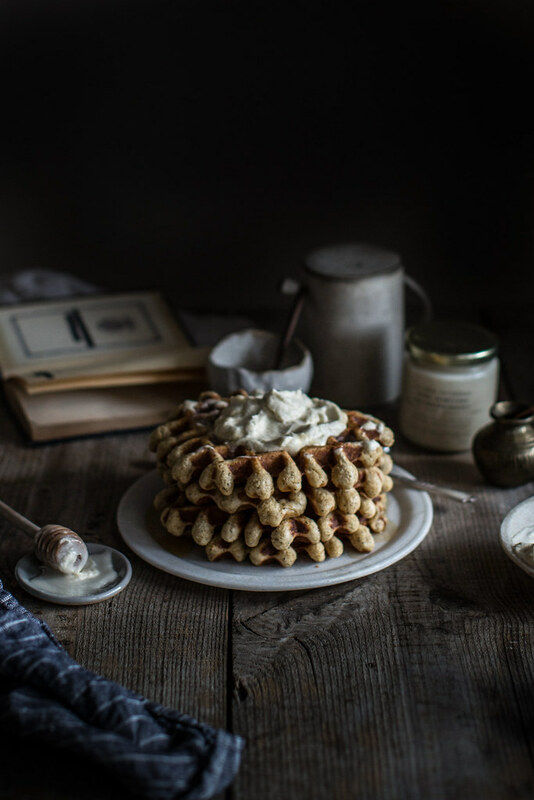 Comfort heaped upon comfort, buttermilk brown sugar waffles infused with the floral, bergomot scent of Earl Grey tea and warm vanilla. These need nothing more than to be topped with lightly sweetened honey cream and served alongside a cup of excellent coffee or tea. They're an ode to Sunday mornings in both how simple they are to make as well as how special they taste. Bring the milk to a simmer, remove from the heat, and add in the two tea bags. Let steep for about 5 to 10 minutes. Remove tea bags, squeezing them gently to get flavor out. Set the milk tea aside. Meanwhile as the milk steeps, whisk together the flour, baking powder, salt, and ground tea in a large mixing bowl. In another mixing bowl combine the dark brown sugar, vanilla, eggs, butter, buttermilk, and the cooled milk tea. 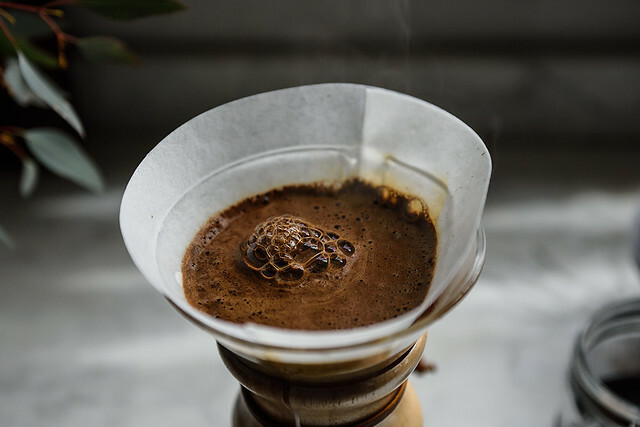 Stir to combine thoroughly. Pour the wet ingredients into the dry ingredients and stir to combine until no dry bits remain. Don't over stir the batter, a few lumps are fine. Heat your waffle iron and cook waffles according to the manufacturer's instructions. 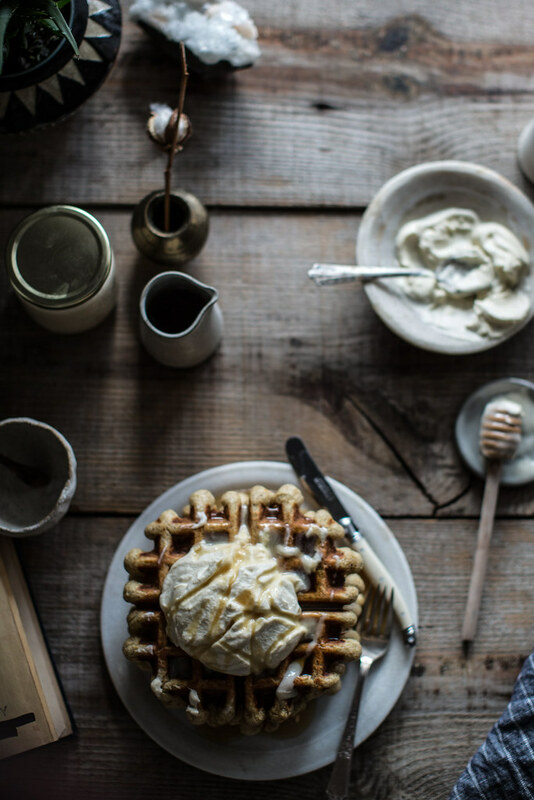 While the waffles cook, whip your cream lightly in a stand mixer or with a hand mixer. You can obviously just do it by hand but that will take a little elbow grease. It's what I usually do so I can tell myself I worked out while making waffles. Once it reaches soft peaks, gently whisk the honey in by hand. Whipped cream should be soft and fluffy, not stiff and over-whipped. Enjoy with coffee or tea, whatever your poison be! All photos of me or my hands by Eric Charles Peterson. 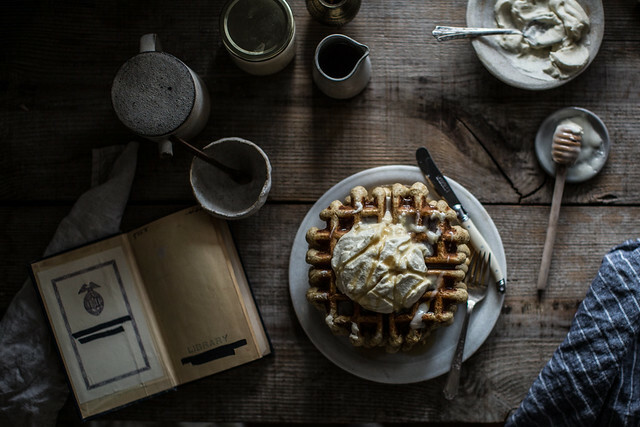 Earl grey waffles sound like such a delight. These are lovely! 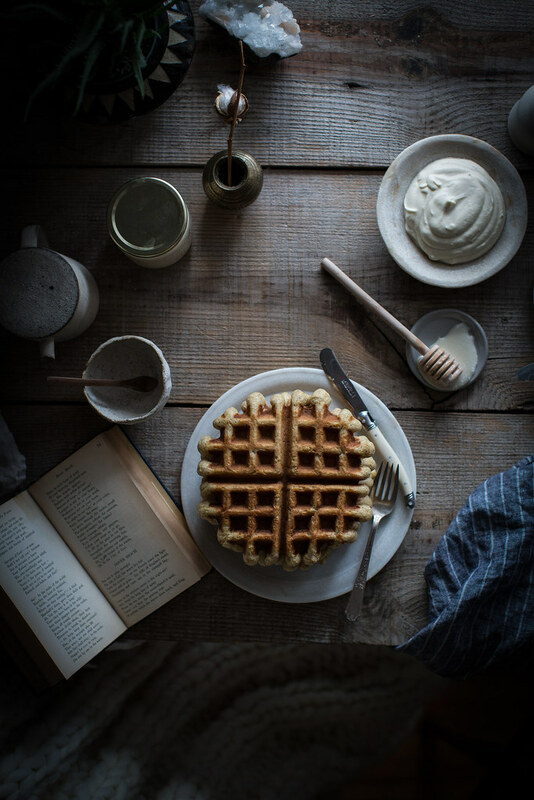 Beautiful waffles, and a beautiful story! so so much love and warmth to you, Beth — I am so glad you’ve found someone to mirror and hold your infinite complexities and contradictions. and of course — congratulations on three years. what a wild three years! I don’t know you but I love reading about your adventures and viewing your amazing photographs. It sounds like you are beginning your biggest adventure yet. I love coffee so having your own barista sounds like the best thing ever. I found your blog and I was instantly hooked on it and even shared with a friend who is a foodie! I look in my inbox, always hopeful there is a new post from you. I’ve just spent 2 weeks in Lisbon on a work/holiday. I wish you well on the rest of your trip and wish you all the happiness you can find on finding your true happiness in the place you call home, life is a great journey and well worth the trip! I feel lucky to say that I know that love. It’s a beautiful, crazy, seemingly impossible love… until you have it and hold it and it becomes a part of you. Happy for you, dear, and this wild ride you are living. Just keep being true to yourself. Oh, these images stun me. 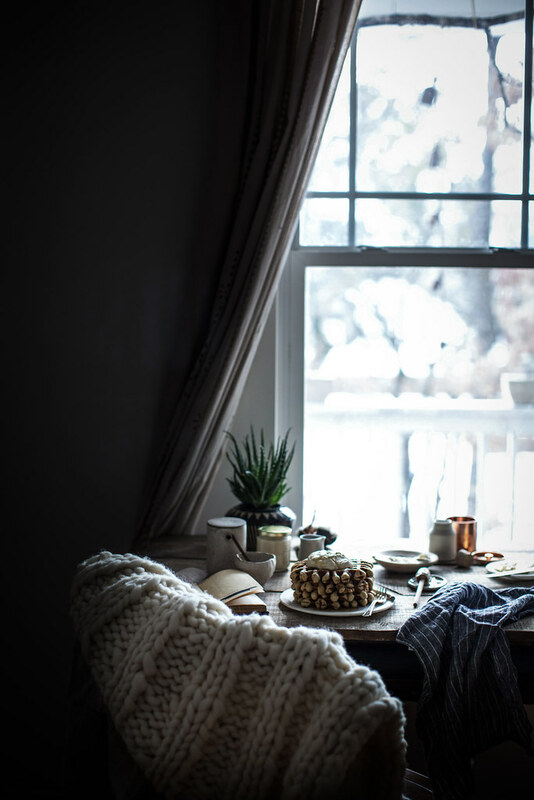 Those moody dark corners… LOVE. Magic. This is the first time I not only enjoyed the photos, but the story as well. Will definitely make the waffles too; I know who will love them. 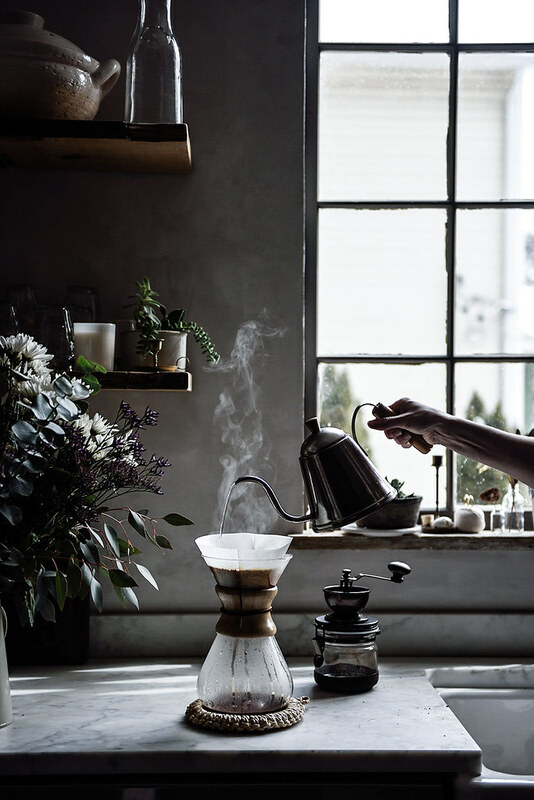 Lovely thoughts on meeting & falling for the man who is a purser of good coffee. And yes, forever, is something that you can really know…. I meet my man when I was 15 and we have been married 37 years and I still know that it is forever. The recipe is delicious, I’m sure, but the photographs are just stunning! Beth, what does one even say to someone who’s fallen in love? Good luck? May the force be with you? I hardly know. But, I couldn’t leave this space without saying something. So, I guess, if anything, thank you. For your honesty. For your three years. And for everything you’ve shared over those three years; all your words, your photography, your poetry. Because, that’s what this, all this, is; poetry. It’s a forever beating heart. And, with any heart, it’s bound to fall in love and it’s bound to break, and we tend to convince ourselves that the breaking is bad. We tend to believe that being anything other than steel makes us highly exposed to the mystery that is love, that is life. But it’s not true. We don’t have to steel ourselves. To be soft, to be still; you don’t have to forego your strength. You can both soft and strong. You can be both wild and wildly in love. But, as I was saying. Thank you. I can only hope that you continue to share on this space, and if not here, than certainly with those you love. And I hope you continue to follow your heart, forever, however far forever may be. Because if anyone deserves the truth that rests there, it’s you. I have been itching to just sit down and go online ever since I cautght up with my instagram feed this morning and had an inkling of this post. Because I just knew it ahah, and I adore that I feel vindicated when a couple of weeks ago, while reading some comment of yours on one of your instagram posts I found myself thinking “This girl’s in love. I hope it’s reciprocal.”. As weird as this may make me in anyone’s eyes, I believe I have a thing for reading people across a screen I do not possess when face to face with those same people. And I am very good at knowing what moves people, and who are those tha are truly genuine and those that aren’t. I discovered your blog fairly recently, granted, but it immediately struck a chord with me, and I found myself falling for it, for the inkling of a life so different from my own – I hate travelling, I am fairly untalented, I verge on the antisocial – from a culture so different and a lifestyle miles away from my own, and yet resonating inside me with some sort of… recognition. I come here time and again for your recipes, they make me curious, your pairings are odd to my palate, or virtually unthought of to me, and yet sing with this southern mystique that entrances me deeply (New Orleans, plantations, Anne Rice and vampires, don’t ask. Also Scarlett and Rhett. ), I come here for the photography that weaves a strong spell at my heartchords, but mosty, I come here for the words. They’re like water. I admire people who are not afraid to own themselves, their feelings, their true beings. I admire people who put themselves out there because there is no other way for them to be. Honest people. Lives that aren’t styled or edited for the sake of a blog audience and sponsorships. People you can feel you know them just a little, and that sound very genuine, all the time. Even though you might never meet them face to face. People who are not afraid of being honest and real about who they are, the good, the bad, the beautyful, the ugly – it’s all there for anyone to see, and I can’t help but like these people better than the rest. Even if their beliefs are worlds away from mine, even if our likings have nothing in common, these are the people that move and inspire me, and you are certainly one of them. It does happen, that sense of forever. It does. And life will happen, inside that love, and maybe there will be times when you wonder about it all, but if it’s the one, it’ll be there all the time, that feeling. As long as it lasts, at least!! To paraphrase one of my favourite poets, the great Vinicius de Moraes “(…) que seja eterno enquanto dure.” (may it be eternal as long as it lasts, here’s the link to the whole poem if you feel curious: http://www.releituras.com/viniciusm_fidelidade.asp). Best of times for you, Beth, and congratulations on your three years of this mighty amazing blog of yours. May it also be forever as long as it lasts!! and I’m sorry for my ever soooo long comments, can’t seem to be able to help mysef! What a beautiful and honest post. It spoke to me so much as a similar thing happened to me. We fell in love and he left the country planning never to come back. Nine months later he did and nine years later we married. Sometimes you really do know it’s forever and it’s terrifying and somehow works out perfectly. So blissfully happy for you! Welcome home! So lovely and honest … I agree with Meghan…what does one say to someone who has fallen in love? So very happy for you. Love…does bring the world to your doorsteps. I’m always in awe when I read a new post of yours. Your talent to envelope us into a story, open your heart, share your soul, and do it so eloquently and beautifully makes me want to read more. And stay here with you. Your words are like poetry. And well the photography is simply amazing. I have my own space too and I feel so inadequate in comparison. I still have tons to teach myself and learn, although some things I think are innate, like your ability with words. I know the comparison is silly because we are all unique and what makes us special is being ourselves and different. I don’t want to be you or anyone else. I like myself (finally realising that) and who I am and into what I develop and evolve with each passing day and experience. But I will admit that I aspire to reach the level of ease with which you write and take pictures. Thank you for sharing. Love is beautiful! So happy for you, thanks for sharing. Such a beautiful post on all accounts. Achingly beautiful. It’s amazing how committments seem all important and then diminish when we are missing the ones we love. Sometimes being apart makes for some of the most spectacular love letters. I suspect yours are exquisite. Three years of happy readers. Thank so much for every single post Beth. You have built such a beautiful space and it has become such a lovely part of my ritual Beth. I am so thankful that love has come to you during such a wild time (as it does, always). My heart is happy for you sweet girl! 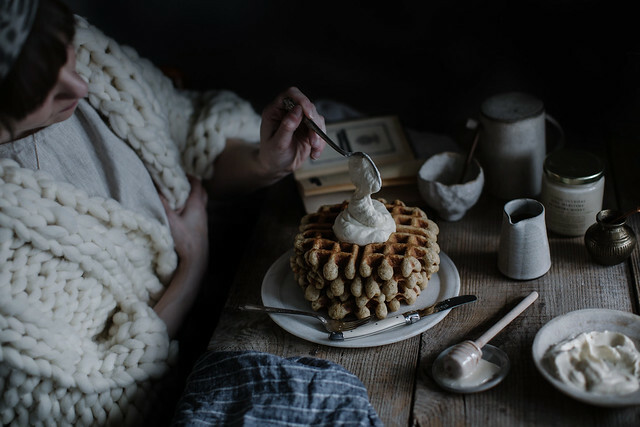 What a poetic juxtaposition of the textured weave of your chunky knit scarf and the stack of waffles…no wonder such materializations appear as you begin to weave your heart with another’s. You make me wonder : and if true love really exist ? Wishing your relationship all the very best life that brings you after you make that final landing called home. WOW!! This looks deeeelish! These waffles are huge! Why kind of waffle iron do you use? Just curious. I never believed in love, all my life I thought it was some made-up thing. Maybe because I never witnessed it from my parents or because my first serious boyfriend and I cheated on each other like it was some kind of olympic sport. But 5 years ago I found love, like lovey-dovey, kiss and cuddle, hold hands across the table, make people nauseous kind of love. And I love it. And I’m so so so happy for you. Your images are breathtaking. Your writing heart wrenching. And yet you might be the coolest person I’ve come across in a while. Stay strong. Hi …I have recently found your blog. I live in Auckland New Zealand. I love everything about your style, your writing, your photography, and the way you share your world! I’m going to start a blog about food and life…not sure what the angle is yet….anyway…I love that you shared your new love story…its inspiring, encouraging, beautiful and spreads the hope of the magical twists and turns of living this life . I am at a time in my life of complete and utter heartbreak…..so to read your soul bearing words restores hope and vision…I am crazy about food, and about surrounding my life with beauty, richness, friends, color and all those things that feed the soul…thank you for your blog. It is blessing, and inspires me so very much. Enjoy your new love!!!! You have me in tears here Beth! So much love to you lady and thank you as always for such gorgeous work. Travel home safely to your love! lovely words, story and pictures…! I have just discovered your blog and am working my way through your stories. You are a wonderful story teller with both words and pictures. I have also started to make up your recipes as they as divine. Now run like the wind…..I am sure there is coffee brewing. 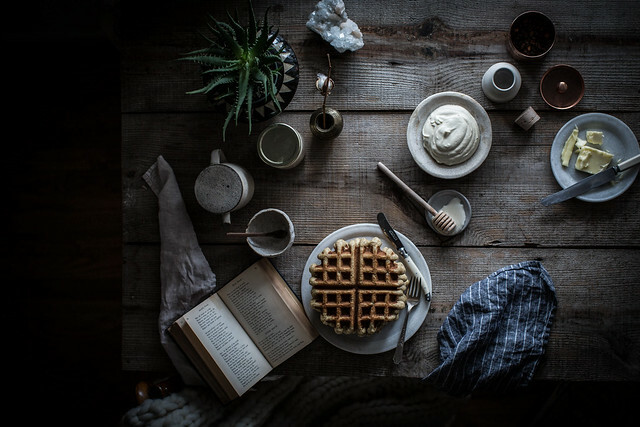 The story, the love, was warming; the waffles divine. Congratulations on 3 years, your pictures, recipies and stories always awe and inspire me. There is such raw beauty in your storytelling and I thank you for that, for sharing your life so honestly with us. I hope that you are able to find joy in the rest of your travels, even through the homesickness. Safe travels home to the arms of your new love. While reading this poetry my heart fluttered and my toes squeezed tightly. This is how I know something speaks to my soul.. Thank you Beth for everything you have given us these last 3 years. Never stop. Much love. What a beautiful sentiment. I love this post, and not just for the gorgeous food/photos. I’m so happy for you, Beth. Dear Beth, I’m inspired by these waffles soooo much! I hope you will find some inspiration in my beautifull Croatia too (I miss it a lot)! Reading you soon and bon voyage back home! Your writing is so beautiful, Beth. I love this post. And such perfect photos. I’m in awe. Such a beautiful story…I hope you get to be with your man very soon! Beth, you deserve so much happiness. And those waffles, I hope they’ll get you there for now, until you’re back at home making waffles alongside with him making coffee. You speak your truth, and few do. Robert Frost once said “Love is the irresistible desire to be irrestiably desired.” Ain’t that the truth. Kudos, love found you and you recognized it!! Earl Grey all the way! As well, congratulations on three years of running a fantastic food blog! 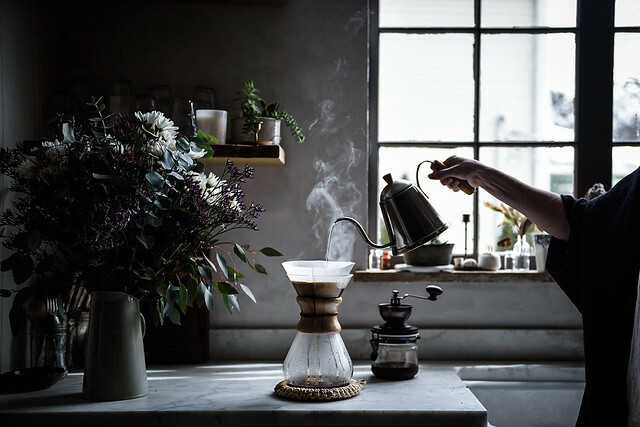 As always beautiful photos, recipe and story. Thanks for sharing. Yes. Yes! To all of this! Totally wonderful. I do not even have the words. It’s clear from the comments you’ve heard this a hundred and one times but…! You’ve fallen in love with a boy and I’ve fallen in love with your writing! 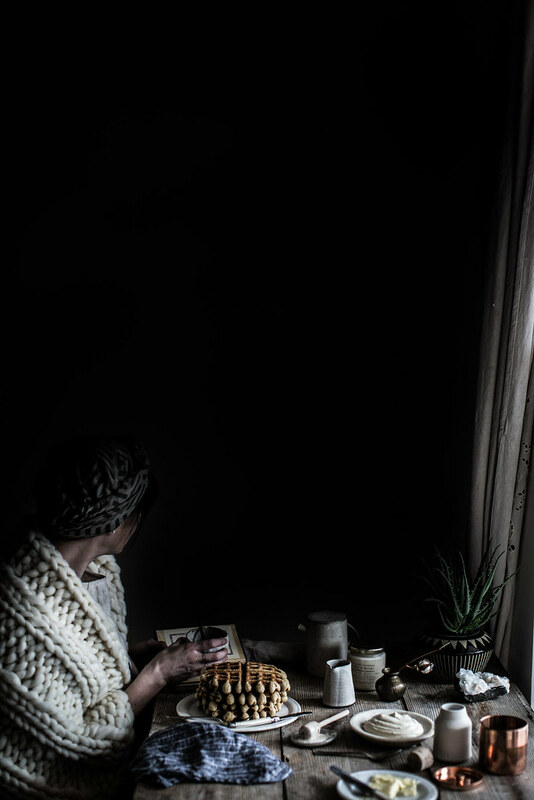 I could read this story all day 🙂 I came to this post first for the imagery, second for the perfect mothers-day recipe and found a blog I truly loved reading- it’s so inspiring! Love this. 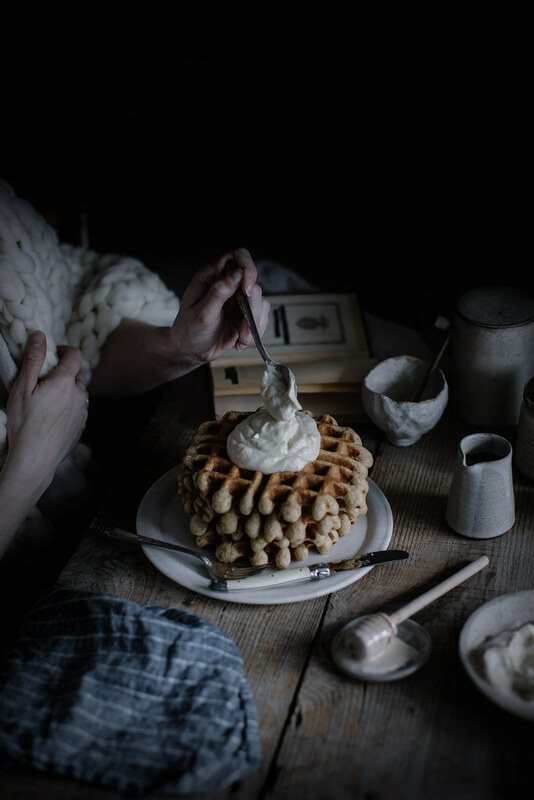 The story, the photos, the waffles! Can you tell me what waffle maker you use? Wishing you a happy 3 year anniversary and excited to see what’s ahead for you on this journey! You are so inspiring and creative! Go back soon… Love is the best! it is an amazing thing, to find that one person in all the world that is meant to be yours. I had that once… hold onto it, stay healthy in body and mind and stay together, but know, that if it is meant to end, be able to see that and let it be an ending with grace. do not hold to tight for too long. i don’t want to be negative in your time of bliss, just come back to these words if you ever need too. you and he, it can last forever, for some it does. for me, not so much. I enjoyed your writings :). Such a beautiful blog that is filled with remarkable words. Congrats to your 3 years mark and many more amazing years ahead. This is such a beautiful and striking story. I’m speechless. I think it’s amazing that you feel this way and that you realise it; that you’re feeling homesick; that you are longing for being with him. I can’t wait for you to go home and be with him. I am so happy that you are celebrating three years in this space. And I hope you continue on because I can say, without hesitation, that your blog is my favorite out of all the blogs (don’t tell the others). I love your photos and your writing is amazing. I am so glad you shared this story. It makes a beautiful blog even better to hear the honest life behind it. Thank you for doing what you do! Dear Beth, thank you for sharing this beautiful story and beautiful pictures, it was amazingly touching. Everything you wrote is so true! I am also on the way for years, and I just realized the same: home is where the heart is. Even if you are in a beautiful place, even if you love what you do, if you cannot share it with somebody…slowly life becomes meaningless. And when we finally find the One, we know that we arrived home. I will be back home in 4 months and can’t wait to do the same: to have coffee and waffles on a quiet Sunday morning with him. I wish you that time flies quickly and can’t wait the next post! These waffles look incredible! You are so talented… And your story is beautiful. Your blog is so inspiring! Congrats on three years and best wishes on your new love adventure! 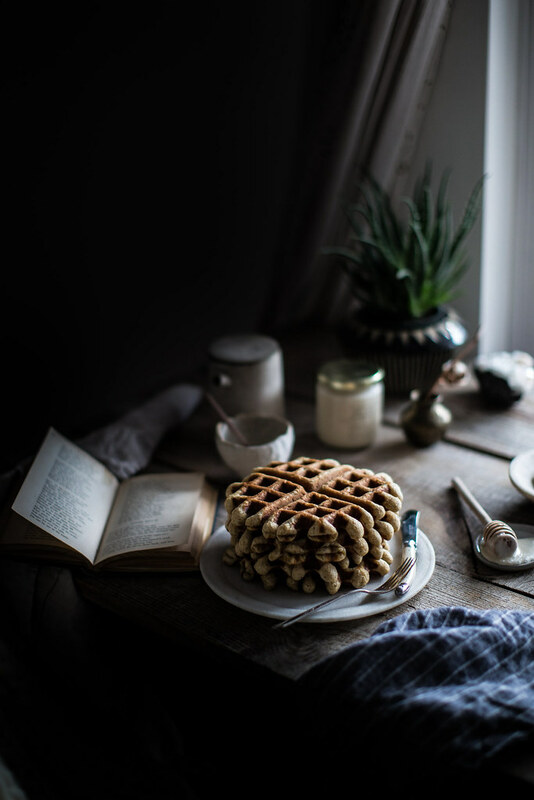 Coming home to the comfort of waffles and your man…what could be better? oh my these look like perfection! I definitely know what I want to for breakfast tomorrow morning… fantastic! Great photos too, and of course congratulations on three years! Such an achievement, keep it up and thank you for all the inspiration! Such a lovely post, photos and story. Additionally I love the honey whipping cream idea. This is why breakfast food can be eaten for any meal! Thanks for sharing this post. If you get a minute I would like to invite you to checkout our list of the Best Cooking Blogs which features the Local Milk Blog http://www.listsforall.com/best-cooking-blogs/. We really like what you do with your blog, and it was an easy choice to add your blog to this list. Thanks again, and keep up the good work! This was such a lovely read. Thank you for sharing! 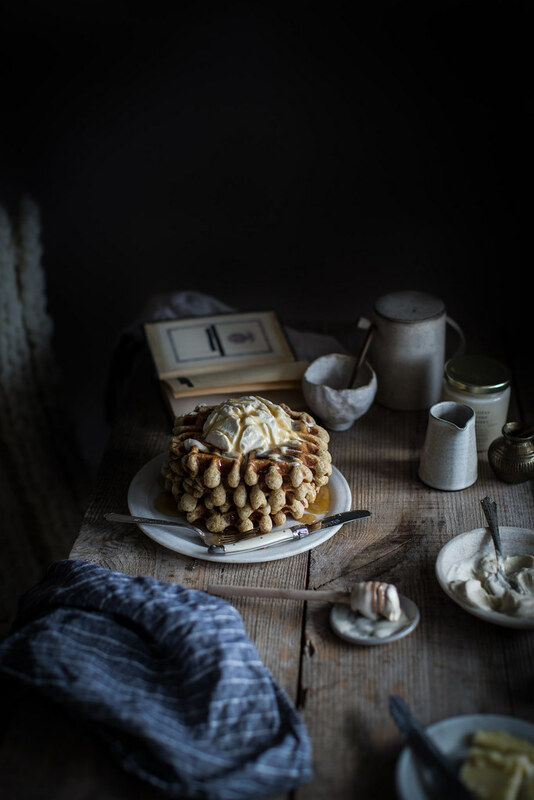 These waffles look heavenly! Hi Beth, I too fell in love and like you I left the country for 3 months. I lived in London during that time to try to work out my feelings. It wasn’t supposed to be like this right? But all you think about is him and your future together. And now home becomes wherever he is. I returned to him and 1 year later we were married. I wish you all the best! Life is about the joy of love. Congratulations on 3 years of Local Milk and finding forever love. And, thank you for this comforting recipe that I will enjoy over and over again. Three cheers for love. After having spent two months on the road for work, being home is a wonderful thing. 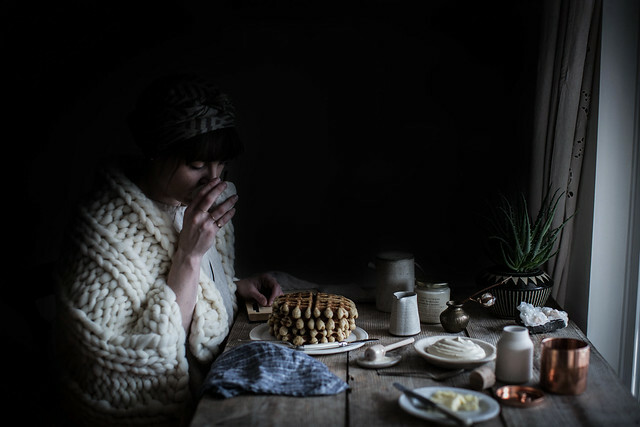 That it might involve Earl Grey waffles and coffee for you–I wish that for you. Love will always win. Can you tell us a bit about the beautiful sweater or wrap you are wearing? Your words and images, as always, inspire the hell out of me. Thank you. As someone whom has found the same kind of forever love, it always gives me chills to read others stories, of when they knew. I knew that very first night I met my husband in a tiny karaoke bar in Philadelphia, and couldn’t sleep a wink all night because I just kept telling myself, “he’s the one,” but then quickly tried to dismiss it over and over again. I’m glad I wasn’t able to. Now almost 7 years later we’re happily married, living in the mountains that border France and Switzerland, with an adorable and happy little girl, and another baby on the way. Life and love is good. As for this recipe, well I told my husband he needs to try to pick up a waffle iron on his way home. That’s what bike baskets are for, am I right? Also would you mind sharing your tried and true traveling apothecary routine? We travel a good deal back and forth to the United States and around Europe, and although I have a routine down I’m always open to more great ideas! Thanks again and congrats on three years and finding true love!!! I think we need a new post in here- it’s been way too long! Totally agree with the above comment – that blog’s posts can only make me stop in my footsteps and read all day long! How artistic your photos! and the waffles look almost like belgium waffles! I will need to try these for sure. I love this story, the pictures and your blog! This is such a great post. Thanks for sharing the story. This recipe sounds amazing, too. ah! you seriously have the most amazing & inspirational style + photography. so happy to have come across what is probably now my all-time favourite blog. your kitchen looks stunning. I see that you have been to Portugal a couple of times, how do you like it? My family is from there and I visit frequently. Hope you loved it! Well, I tried to expand on the ‘WOW’ for the recipe, the photography, and the writing, but I never managed any better. I guess I’ll stick with WOW and thanks for sharing. I know what Sunday breakfast is this week. What a pleasant surprise! I thought I was opening a link to read a waffle recipe, but I found a love story instead. Thank you for sharing your heart. The lighting in your pictures always puts me in the mood to get cozy and read poems by the fire. Looks great! Unfortunately breakfast doesn’t come until tomorrow.